Bookride: Martin Parr. 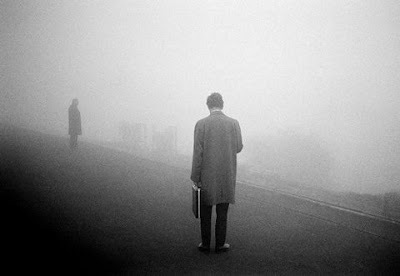 Bad Weather, 1982 + the world of the Photobook (according to Parr). Martin Parr. 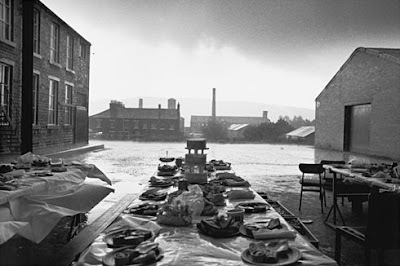 Bad Weather, 1982 + the world of the Photobook (according to Parr). Martin Parr. Bad Weather. Zwemmer, London 1982. A mere 62 pages in soft wraps with 54 b/w photos. Text includes a commentary by cult status weatherman Michael Fish. Parr is a highly collected and gifted Brit snapper (born 1952) who at some point was inducted into Magnum to the disgust of vieux humbug Cartier Bresson who described him as being from "a different solar system." MP is also responsible for the droll collections of 'boring' postcards, now up to 3 books -they have practically become a franchise. Parr has a 'whim of iron' as Powell said of Betjeman. Both top photos from this superb book. VALUE? Copies on web are mostly £200 +, seldom less. Signed copies are more expensive but Parr is the Edward Heath of signed photo books, signatures add little. 'Bad Weather' is the kind of book you might find at a boot sale under a cold British sky for buggerall - it looks like nothing. Its value has stayed at this level for 3 years now. One prominent dealer says of Parr '[his] influence in contemporary British photography is unparalleled, but it is his contribution to the understanding and importance of photographic literature that may be his most profound legacy.' They are talking about his magisterial 2 vol 'The Photobook' which sits on a shelf beside me as I type. Was $8500 late 2007. One of 10,000 signed and numbered by the photographer. A book so large that it comes with its own metal folding stand, engraved with the author's name. Still goes for about the same money, or as much as 25% less due to the state of the dollar. Some surrealists want $14000 and even $25000. Dream on! David Bailey's Book of Pin-Ups, 1965. Sixties flared trouser cockney sparrow pointedly ignored by Parr ( they have probably had bidding wars as Bailey is also a great photo collector.) Was $7500 in mid 2007. A copy made $7000 mid 2008 but it had made $14000 in 2005. Probably standing still in price, not esp rare but hard to find complete (36 pics) and in good nick. P.H. Emerson. Marsh Leaves. 1895. $5000 mid 2007. Not really tested since but an unpleasant copy on ABE at slightly more than this seems to have sold in late 2008 and would now expect a decent copy to nudge into five figures at auction (with the juice etc.,) One of the greats. Was $800 early 2007. 2 copies on ABE now -one at $3000 and one not so nice at $4000. Freakish book of which the mighty Parr wrote "one of the humblest, yet most essential of objects is catalogued as precisely, regorously and objectively as any work by a 1980s Conceptual artist" Not a book to buy at these levels but to find somewhere overlooked (in the cookery section.) Probably sells regularly at half these prices. It's appeal is essentially whimsical. 300% increase. $7000 early 2007. In 2008 it made $15K (fine in slightly used d/w) and $32K (F/NF) and was bought in at $3k in an unpleasant jacket. All at Swann NY except the $32K which was at Christie's NY where it was described as 'A FINE COPY OF FRANK'S MASTERPIECE, and rare in this condition. (Quotes Parr) "The most renowned photobook of all... none has been more memorable, more influential, nor more fully realized... it changed the face of photography in the documentary mode". $1000 in early 2007. Bad copies now at $1100 better at $1700, a chancer at Amazon wants $2400. Society photography, social document tend to be beneath the Parr radar, below Parr- as it were. $850 early 2007. Can now be had at under $700 and from Japan at slightly less than $600 as 'supply and demand' takes over. His 'Babyland' from 1995 can be had for less than $300. Still $400 and on some days less. Parr still has no time for Weber. A Wonderful Time. 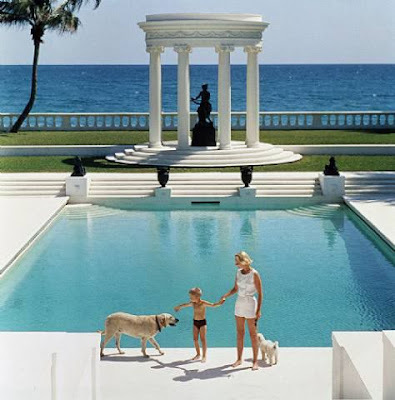 Slim Aarons, 1974. Outlook? . Not an area I would like to wade into with credit cards flying right now, but there may be further life in the market especially with the incunabula of photo and proven geniuses like Emerson and Sander. 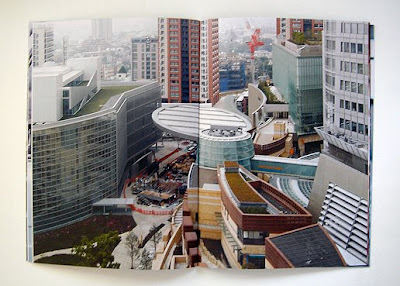 The problem with most photobooks is you don't get much for your money. Their value derives from their iconic significance, sometimes $3000 gets you a small thin glossy book with a few printed b/w snaps. As one wag once observed (paraphrasing Veblen) 'modern art is a rich man's way of making poor people feel stupid.' So in this spirit the fact of a book looking insubstantial and even insignificant is no bar to its being valuable--in fact it helps. The 'mere man' cannot possibly appreciate this stuff. You demonstrate wealth and status by possessing it and recognising its true value. This may change - as it has before. I'm just working on beefing up my Scouting Book, adding everything my little brain won't absorb. Thanks for this nugget. Got a BEAR POND in my local book store for $150 fine and fine-- great book, right price. Now I want his Rio de Janeiro book. Catapult. I don't get the photo market. I have a nice David Bailey artwork (A3-ish size) i bought at a charity auction - the same auction had a signed photo of some 60s person which went for twice the price of the artwork. I like the quote on modern art! I can see why unsavoury rich men pay huge prices for Newton's equally unsavoury books but the oddest thing is seeing new Martin Parr books advertised on the Guardian web page at staff prices - who is buying them? Heads of social work departments? I'd say Helmut Newton's works are about unsavouriness [is that the word?] rather than being unsavoury. There's a conscious absurdity and a recognition of that absurdity that stops them being unsavoury. The real absurdity is the fact that photographs- invented to be easily and indistinguishably reproduceable- and photography books should be such an important part of the first editions/first impressions trade. does someone have an idea how much worth this publication might be? to dream on . a sumo did sell for 15,000 in august. so while your dreaming others are making money. wake up!